Construction zone accidents typically occur because of excessive speeds, drunken or impaired driving, or because people are simply not paying attention. 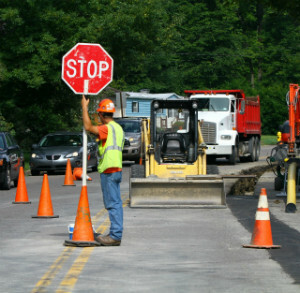 Although traffic is contained and generally slower in construction zones, they are still a common location for traffic accidents. Interstate 64 (I-64) in the St. Louis area is a frequent construction zone. With signage and heavy equipment blocking the view, shifting and unclear lanes, and large numbers of people on the roadway, it can be extremely difficult for motorists to navigate these traffic and road conditions. Construction zone accidents typically occur because of excessive speeds, drunken or impaired driving, or because people are simply not paying attention. Car accidents and truck accidents in a construction zone can include head-on collisions from someone driving on the wrong side of the construction cones, to rear-end collisions when a driver is driving too fast for conditions and then can’t stop when traffic comes to a standstill. At The Hoffmann Law Firm, L.L.C., we represent the victims of construction zone accidents, including road construction workers struck by cars or trucks that have veered into the work zone. Attorney Christopher Hoffmann has more than 15 years of personal injury experience, including handling complex cases involving multiple parties. If you suffered a serious injury in a work zone or construction zone accident, our experience can make a difference in your case. Contact our firm at (314) 361-4242 to schedule a free and private consultation.